Janine Giordano Drake recently suggested that it might be time to stop using the language of a "Fundamentalist/ Modernist Crisis" when explaining early-twentieth-century U.S. Protestantism. Books by Matthew Bowman and Priscilla Pope-Levison have certainly pointed towards a more cautious use of the "fundamentalist/modernist" binary. Work that is a bit older, especially work done by scholars of the turn-of-the-twentieth-century holiness movement, has made similar claims. In his 2004 biography of early Pentecostal leader A.J. Tomlinson, for example, R.G. Robins argued that "there are sectarian modes of modernity” and that, instead of providing a shelter for rural values in the city, the radical Holiness movement adapted “old cultural forms to new social realities." 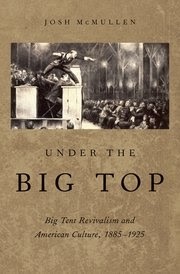 Josh McMullen's Under the Big Top: Big Tent Revivalism and American Culture, 1885-1925 (Oxford, 2015) continues this push to rethink how we organize early-twentieth-century U.S. Protestantism. Taking the most popular turn-of-the-century revivalists and the spectacles they produced as his subject of study, McMullen suggests that big tent revivalists should be understood not as anti-modern reactionaries or fundamentalists but as participants in the transition away from a Victorian culture (with its emphasis on self-control and the importance of character) to a modern consumer culture (with its emphasis on self-fulfillment and personality). This view of big tent revivalism challenges and refines the Fundamentalist-Modernist binary, mainly by consigning its usefulness to the narrow bounds of particular theological debates. Since McMullen is not concerned with those theological debates -- his revivalists "were not primarily theologians," he writes -- the fundamentalist/modernist categories are not especially helpful. Instead McMullen is interested in the interaction between the rise of a mass consumer society and evangelicalism, especially the "unique and important role" big tent revivalists played in combining "the Protestant ethic of salvation with the emerging consumer ethos" (6). So who were the big tent revivalists? For McMullen they were the professional traveling evangelists who drew the largest crowds in the years between the 1880s and 1920s -- years when attending revivals was an especially popular American pastime. Maria Woodworth-Etter, Aimee Semple McPherson, "Gipsy" Smith, Billy Sunday, and Sam Jones are the main players in McMullen's narrative, with supporting roles played by F.F. Bosworth, J. Gordon McPherson, and Burke Culpepper. Although Dwight Moody's career overlaps with some of McMullen's big tent revivalists, McMullen does not focus on Moody. He sees big tent revivalists as the competitors for Moody's mantle and the builders on the foundation that Moody laid. The diverse religious affiliations and affinities of McMullen's big tent revivalists may cause some to question how "big tent revivalist" can be viewed as a coherent category. In McMullen's study, individuals associated with Pentecostalism and divine healing join those who rejected such signs of the Spirit; evangelists like Smith who thought women had no place in the pulpit join women evangelists; and revivalists like Sunday who often garnered community-wide Protestant mobilization for revival campaigns join those who, like Woodworth-Etter or Bosworth, operated on the margins of the Protestant establishment, even if they did manage to gather crowds. McMullen is aware of the individual differences between revivalists. Indeed, one of the great strengths of this book is his attentiveness to nuance and complexity. But he is usually more interested in what the revivalists had in common. McMullen's diverse group of revivalists clearly shared recurring themes in style, particularly "the quest for authentic experience, emphasis on personal/physic abundance, and the desperate need for the old-time religion" (88). It is on those similarities that McMullen most often dwells. A crucial aspect of McMullen's argument is his claim that revivalists were not "Victorian holdouts" but instead were critics of Victorian culture. He argues that revivalists viewed the Protestant church of the late nineteenth century as spiritually sedate, devoid of passion, and all too comfortable with the trappings of fashion and respectability. The Victorian church had let the world enter its walls and had all but given up on its mandate to reach the lost with the message of salvation from sin. What was needed, then, was religious passion: Christians who would go out into the world to convert it before the world came into the church. To reach the world, Protestants -- and especially those Protestants who made evangelism their profession -- had to go where the people were: the cities. Once there, they needed to make their message resonate with an urban culture increasingly influenced by a mass consumer ethos. Thus, even though big tent revivalists "retained nineteenth-century Protestant language that emphasized sin, character, salvation, and hard work" they increasingly spoke this language "with a consumer accent" (4). Their desire to make their message appealing led them to an ambivalent relationship with mass consumer culture. While they certainly criticized some cultural developments, they also sanctioned new trends and relied heavily upon new forms of communication, technology, and marketing. The bulk of McMullen's book charts the complex relationship that big tent revivalists had with broader cultural trends: the rise of entertainment and celebrity culture; the emphasis on personality and self-fulfillment; the therapeutic search for well-being; anxieties over American manhood. 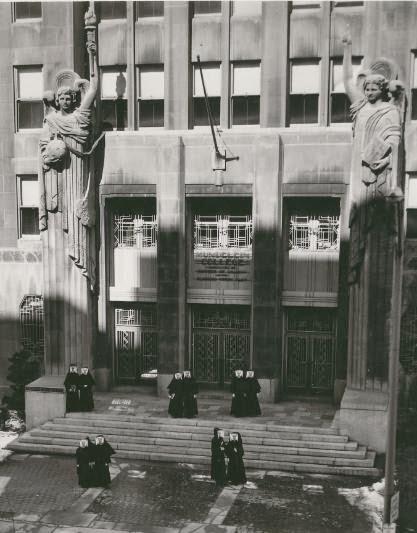 Through it all, big tent revivalists charted a path which made their brand of Protestant religion a viable option for Americans who shared both their concerns about the potentially dangerous affects of cultural shifts and their acceptance and even celebration of some aspects of the emerging mass consumer culture. The trope of the "old-time religion" looms large in McMullen's book, and is worth mentioning briefly since his interpretation of it is indicative of his overall approach. As he does elsewhere, McMullen eschews a theological analysis. While recognizing that revivalists generally adhered to conservative Protestant tenets regarding the need for individuals to receive salvation from sin through faith in Jesus in order to avoid eternal damnation, McMullen argues that theology was not the defining element to revivalists' emphases on old-time religion. Instead McMullen focuses his attention on the packaging of the message of old-time religion, viewing it as an evangelical adaption of a broader cultural trend. Specifically, McMullen argues, old-time religion was primarily about the quest for authentic religious experience; it "overwhelmingly meant the restoration of spiritual passion" (39). Viewing revivalists' calls to return to old-time religion in this way places the emphasis on evangelical Protestantism as a style, rather than as a set of doctrines -- similar to the approach Matthew Bowman took in The Urban Pulpit. Although there is much that I love about this book, it would have been interesting to see more comparisons between big tent revivalists and other Protestant leaders. This is especially pertinent because McMullen's book seems to be doing for revivalists and for conservative evangelicals what Susan Curtis did for social gospelers in A Consuming Faith (1991). In that book, Curtis argued that social gospelers "helped ease the transition from Protestant Victorianism to a secular consumer culture." Given such similar themes, it would have been nice to see McMullen engage more with Curtis's cast of characters. That being said, scholars interested in American evangelicalism and in the relationship between religion and mass consumer culture will find Under the Big Top an engaging study. McMullen has a knack for making careful, nuanced arguments, and he does an excellent job of placing turn-of-the-century revivalists within the context of an emerging mass consumer culture. I mentioned at the start of this review that Under the Big Top stands with other scholarship challenging the fundamentalist/modernist binary. I should end by pointing out another trend into which McMullen's work fits: like Grant Wacker's America's Pastor, Matthew Sutton's American Apocalypse, Lerone Martin's Preaching on Wax, Kate Bowler's Blessed, and numerous other recent works, McMullen emphasizes the ways in which those who hold conservative evangelical beliefs have been very much a part of the American cultural (and in Sutton's case, political) mainstream in the twentieth century. For scholars continuing to rethink, rewrite, and reorganize how the recent history of American evangelicalism is told, McMullen's book is a must-read.